Arts Integration or Art for Art’s Sake? First of all, I’d like to say that I’m not fond of the term “Art for Art’s Sake.” I can’t help but think of my late Uncle Artie. He was a lovely man, and I’m sure he would appreciate all the effort, but really, we don’t have to keep doing art on his behalf. So, what is the difference between Arts Integration and Arts Study? If you are studying an art form, you are learning about that art form in order to experience the creative process and increase your skill level. If you are studying a core subject, such as math, science or humanities, and an arts practice is used to demonstrate or illuminate a principle in that subject, then you are learning through arts integration. Why does a person interested in connecting schools to their arts community need to know about this? Because the plan that Seattle Public Schools and the Seattle K-12 Arts Learning Collaborative will be submitting to the Wallace Foundation in a few months seeks to “increase access to quality learning through the Arts for ALL SPS students.” To do so, their approach includes placing certified arts specialists in every school, increasing arts integration in the classroom, and strengthening its community partnerships. (If you want to learn more, you can attend their progress report meeting on September 27th at City Hall). Thinking ahead … if the Wallace Foundation grants implementation funding, now is a good time to start imagining how we can help, and if the grant doesn’t come through, it will be up to SPS, local government, and those in the community interested in supporting arts learning, (you know, like, us) to try to make it all happen anyway. So what exactly is arts integration? While teachers have used arts integration practices in their classrooms for decades, it’s still an evolving concept, and an unfamiliar one to many of us. To clarify this part of its directive, SPS is seeking to refine its working definition of arts integration. Under the banner of “Arts Integration Task Force” Carri Campbell, Visual/Performing Arts Program Manager, and Audrey Querns, K-12 Arts Plan Project Manager, have gathered the region’s arts integration practitioners and specialists to discuss what the term should mean. Arts Integration is instruction that connects content and skills from the arts and other subject areas. This approach allows students to deepen their mastery of each subject and skills like creative problem-solving, team work, and critical thinking. Authentic connections between subject areas that mutually reinforce ideas, concepts, and skills, to promote deeper learning. Learning processes include the creative process (creating, performing, and responding) and key learning principles (experiential, evolving, collaborative, problem-solving, and reflective). Learning transcends the initial lesson and is relevant to the students on a personal and cultural level. Clearly articulated learning objectives and criteria in the arts form(s) and the other content area(s). Student understanding is constructed and demonstrated through the artistic process of creating, performing, and responding. High quality materials are used. Terminology from integrated content areas is used correctly. 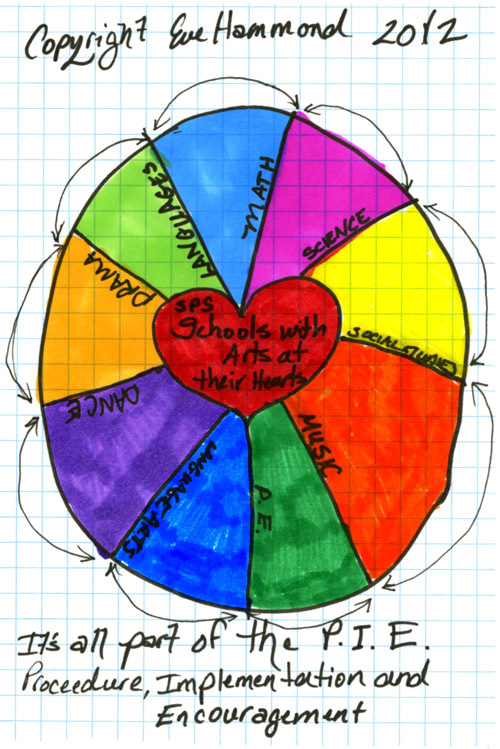 And here is a visual definition drawn by RAC member Eve Hammond, a multi-arts specialist at Hawthorne Elementary. 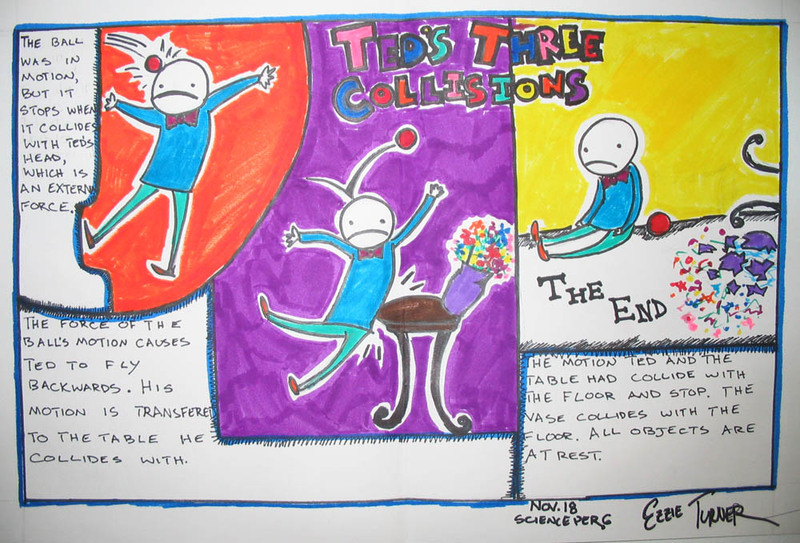 Eve’s drawing illustrates the inter-connectivity between all the disciplines, with no implied hierarchy (and I appreciate this perspective, as the one problem I have with the label Arts Integration is that implies that the arts are only valid in education if used in service to another subject). Arts Integration is a method of partnering arts and non-arts curriculum in order to deepen learning in all content areas. I’ve been fortunate enough to watch arts integration in action at The Center School high school, where my daughter recently graduated. I was curious about the staff’s experience implementing this model of learning at the high school level, especially in math and science, as those disciplines are perceived as less obvious candidates for arts-based learning. I invited Center’s arts integration specialist Wyn Pottinger-Levy, math teacher Nate Chipps, science/chemistry teacher Rachel Zupke (currently on maternity leave), visual art/science/biology teacher Britta Culbertson (currently an Einstein Fellow in Washington D.C.), and film/photography instructor Erin Katz (who left Center this Fall to create a new media lab at KCTS-9), to tell me what they perceived as the challenges and advantages of implementing arts integration in the classroom. Rachel Zupke didn’t know anything about arts integration before she came to Center, nor did she consider herself to be “artistically minded,” but her perspective has changed since she started teaching there five years ago. It was difficult for her at first, but she sees now how valuable arts integration can be as a teaching tool. All kids could learn from it, but it takes a very motivated teacher to do it without help. That’s why The Center School brought Wyn Pottinger-Levy on board as an Instructional Assistant (IA). Wyn worked as a professional graphic designer before deciding to step over to the education realm. Rachel also likes to get practicing artists from the community to come in to inspire and connect with her students, but many teachers don’t have access to outside experts. “You have to know people, or you have to know people who know people.” This is where the job of arts liaison fits in. Nate Chipps is also committed to the arts integration idea and he tries to bring one new integrated math unit into his class curriculum each year. “When it works you get broader engagement and deeper understanding,” but, he admits, it can be frustrating. When you are trying to cover all the necessary elements of an impending state exam, spending a few days on one math principle doesn’t always feel like the most efficient way to get ideas across. How do you get real mathematical “teeth” into a project and still have it work within the required curriculum? Wyn has collaborated with Nate on some of his arts integration units. 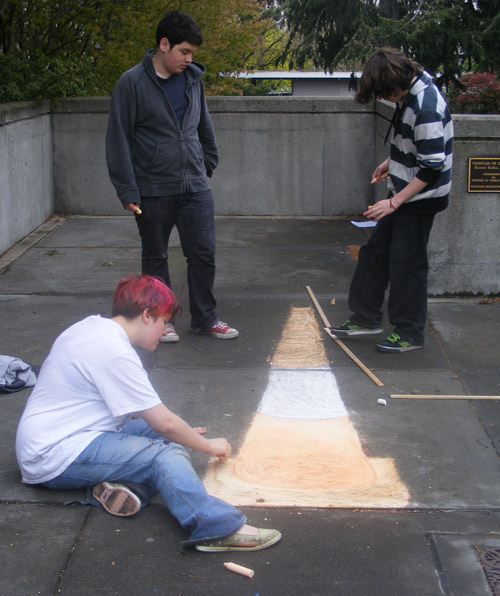 To show how artists can use math, Wyn helped Nate’s students make trompe l’oeil sidewalk art a la Julian Beever and Edgar Mueller using principles of geometry to prepare their perspective drawings. With a background in biology and art and dual endorsements, Britta Culbertson is capable of teaching high levels of both visual art (she taught AP Art at Center) and science, and is thus uniquely qualified to develop arts-integrated curricula. 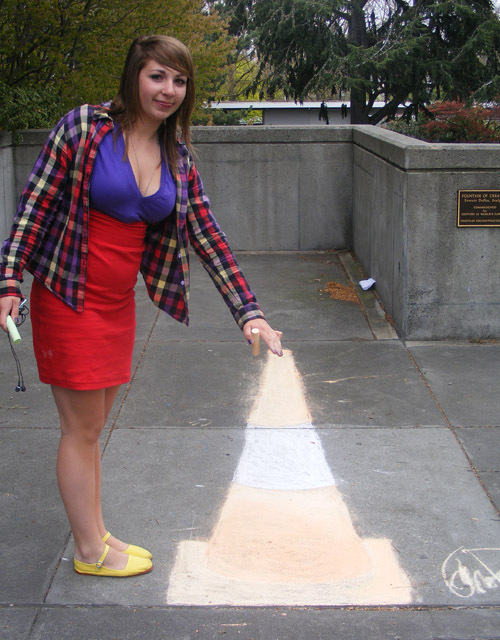 For her, it works both ways: integrate arts into core science classes, and integrate science into your art classes. Evaluating a student’s arts integrated science project, is more challenging than grading a test, Britta admits, (she administers tests as well), but the deeper level of understanding is worth the trouble. First Britta looks at the content. Is the information correct? Demonstrating an understanding of the subject is the foundation of the student’s grade. Next she looks at the arts aspect. Is the information creatively and effectively communicated? Does it look like the student put some Time and Effort into it? You don’t have to know what constitutes “the best art,” only the best communication of concepts, to evaluate the result. It’s sort of like the information is the bread, and the arts are the Nutella. Two years ago, Center made foundation classes in the arts mandatory for all students in their freshman year. 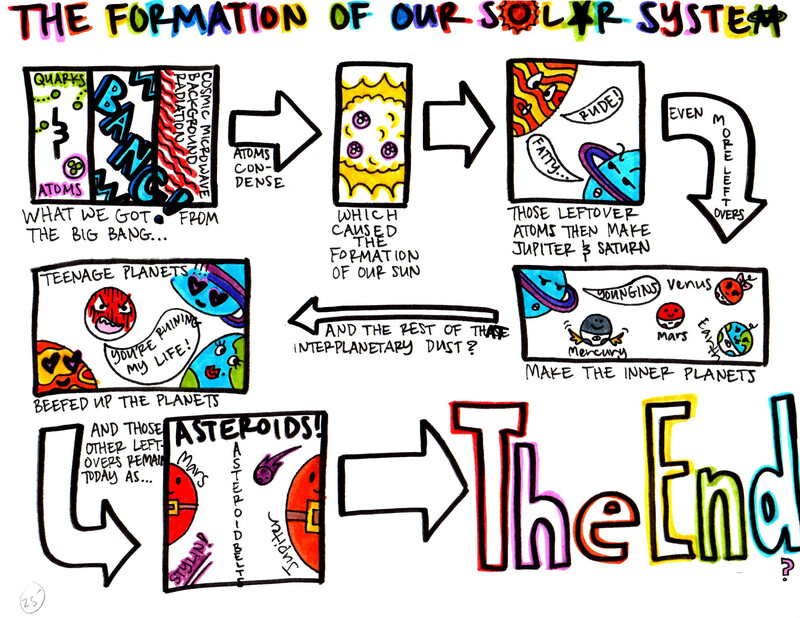 This has helped teachers immensely, as students start learning basic art skills and vocabulary from the outset. 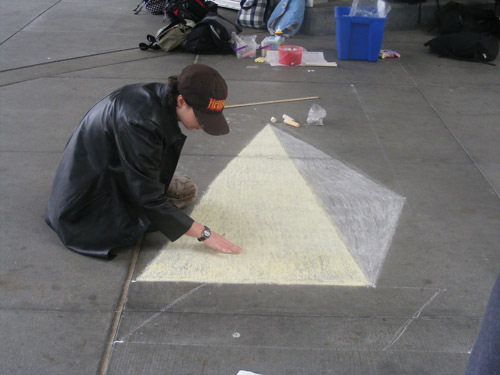 By the time students are Seniors, they have gained broad exposure to a variety of arts techniques and can work independently on their own arts-integrated projects and self-assess their progress. Grace Walker-Stevenson’s Senior project, featured on this blog last June, is an perfect example of the culmination of a successfully applied arts-integrated education. Taking on arts integration at the high school level takes patience, determination, and a certain amount of self-confidence, according to Nate Chipps and Rachel Zupke, especially if you are without training or experience in the arts, but these are lesser hurdles to overcome. The frustration I heard expressed over and over again was: There isn’t enough Time. Indeed, all good teaching takes time. High school staff are already stretching to teach for the mandated tests. Even at Center, where arts integration happens regularly, teachers wish they had time to watch their peers in action, to observe what works and doesn’t work, and combine their knowledge. It is a testament to their dedication to learning that they have done as much as they have. Carri Campbell and Audrey Querns recognize these challenges. They are promising a new framework that will make the arts integral to learning at SPS, not just another straw on the camel. Can we reach a place where it’s no longer a matter of integrating the arts, but of choosing the best tools to teach all subjects in a way that engages and encourages learners to be creative and persevere? Will the training of future education students broaden to support this objective? Both Arts Integration and Arts Study are valid. The value The Center School places on arts learning made all the difference to my daughter’s confidence and success, and very likely, her future. Plain bread is good, but most of us would prefer toast with a little Nutella on it any day. This entry was posted in Art and learning, Arts advocacy, arts liaison, Seattle Public Schools and tagged art for art's sake, Arts advocacy, arts and learning, arts in public schools, arts in schools, arts inclusion, arts integration, arts liaison, Britta Culbertson, Erin Katz, high school arts education, Margaret Chodos-Irvine, Nate Chipps, Pebbles In The Jar, Rachel Zupke, Seattle Public School's K-12 Arts Learning Collaborative, Seattle Public Schools arts inclusion, Seattle Representative Advisory Committee, student art examples, The Center School Seattle, The value of the arts in education, Wallace Grant, Wyn Pottinger-Levy. Bookmark the permalink.